20% Discount on ScreenCastsOnline Plus Complimentary DVD Library! -ScreenCastsOnline is a video podcast of weekly video tutorials (or screencasts) demonstrating how to get the most from your Mac. ScreenCasts are high resolution video captures with a spoken narration describing what’s happening on screen. It’s a really easy way to learn all about your mac, leading mac applications and the latest web services. Each screencast is usually between 15 and 30 minutes long and is delivered automatically to your desktop each week via Tunes or Democracy Player. You can also transfer them to your video iPod to play on your commute or in the gym! plus you get access to the next six months worth of upcoming shows. As well as unlimited access to the entire ScreenCastsOnline back catalogue of shows (that’s over 70+ screencasts published since August 2005) covering a wide range of Mac and OSX related topics. As a ScreenCastsOnline Extra! Premium member, you’ll be given access to secure RSS feeds and full instructions that will enable you to download the previous screencasts via iTunes, Democracy Player or any other video podcatcher, as soon as you sign up! And as a special benefit, if you don’t really want to download over 8GB of high resolution videos, also included in the Premium Extra! Membership is an optional complementary 2 x DVD set of all the ScreenCastsOnline shows since January 2006 – absolutely free! 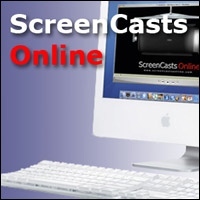 For a limited time, ScreenCastsOnline is offering the Premium Extra! membership to MUG members at a 20% discount off the usual rate of $35. That means a single payment of just $28 USD gives you all the benfits of a ScreenCastsOnline Extra! Premier member as described in detail below. That’s just a single payment of $28 for all the previous shows plus the next six months worth of weekly shows in high definition! If after 6 months you don’t want to renew your membership, no payment will be taken and you will be unsubscribed automatically, you need to opt-in to renew your membership. By the way, the renewal cost is much less than the original sign up fee! If you’d like to take advantage of this special offer (which ends on 12th February 2007) just head over to the ScreenCastsOnline web site and get the special coupon code and the link to allow you to sign up.If you’d like to take advantage of this special offer (which ends on 12th February 2007), get the special MUG Center discount information and sign up! Extra! Member Only Shows – 1 Per Month! Yes, each month you’ll be guaranteed a brand new Premium content show created for ScreenCastsOnline Extra! members only. That’s over 3.5 hours of new premium content not previously available accessible to you immediately once you’ve joined up, plus access to the regular weekly shows in superb high definition straight away! 26 New Weekly Video Tutorials – 1 Per Week! ScreenCastsOnline is published on a weekly basis so during a six month membership you’ll receive 26 brand new video tutorials (including the Extra! only shows) delivered to you automatically each week via iTunes or the client of your choice, in the screen resolution of your choice including Hi Definition (1280×720). There’s a lot of current ScreenCastsOnline shows to watch already and they available to download as soon as you join. If you’ve only got a slow link, or your hosting provider has put a cap on your monthly downloads, don’t worry! New Extra! members can order a complimentary 2 x DVD set to be delivered to your door anywhere in the world at no extra charge so you don’t have to download the past shows. Extra! members will get automatic access to an Extra! section in some ScreenCastsOnline show. Some weeks, the normal ScreenCastsOnline show will have an extra 5 to 15 minutes of content only accessible by Extra! members. This new section will be included automatically in the versions downloaded by Extra! members. All ScreenCastsOnline Extra! members can access ScreenCastsOnline shows in Hi Definition (1280×720). The HD versions of the shows are in stunning quality and can be viewed either full screen on your computer or on a HD TV with fantastic results. No zooming or panning, you see the full screen all the time. In order to play the HD versions, you’ll need a recent machine, probably G5 or Intel based. If you’ve an older machine, the Enhanced Desktop version should play fine at high resolution. This is a popular format of the show called Enhanced Desktop format – 960×540. This is ideal for people who want high resolution versions but may have older machines which can’t cope with the demands of the HD version or perhaps you want to keep the download file sizes to a minimum. This resolution will not require the zooming and panning needed in the free version as it’s clear enough to see all of the screen all of the time. As a ScreenCastsOnline Extra! subscriber you’ll get access to special RSS feeds which enable you to access archived shows directly from iTunes, Democracy player or any other video podcast software. In addition, you’ll get access to the Extra! Members only website which has direct links to the shows in all formats to download directly from the website. There is no Digital Rights Management (DRM) on any ScreenCastsOnline content. If you sign up for six months and download every screencast (that’s over 70+) and don’t renew, you’ll still be able to watch each downloaded show for ever! All we ask is that you don’t share or distribute the shows you have downloaded! The ScreenCastsOnline Extra! versions of the shows (HD, ED and iPod) will be completely Ad free. Each month there’ll be a ScreenCastsOnline Extra! newsletter published and emailed to subscribers. It will contain news, background info on the shows, hints, tips and possibly special ScreenCastsOnline Extra! subscriber special Offers! First Prize: The new iPod Shuffle! The winners will be selected at random from all the Extra! members registered or re-registered each month. Don McAllister was the guest on MacVoices #688, where he talked about his show and the type of training it offers. Don also discussed this offer, as well as encouraged Mac User Groups to use his free shows as the basis for meetings. This offer is available to user group members worldwide. User Group Discount Info: visit the ScreenCastsOnline web site to take advantage of this offer.